But in its absence, enter the camera! Doesn’t this just remind you of Psalm 19:1? The illustration is the picture, praise God! We cannot help but appreciate the beauty of God. Your poem captures the in awe of his majestic beauty moment we all have at many times done adoring the works of his hands. Thanks for sharing a beautiful in "awe of God moment" in poetry dear heart. God bless you richly beloved Sister! Thanks a great deal, dearest sis. Much love to you and yours and happy weekend to you all! There cannot be a better artist than He who artistically molded man in His own marvelous image. we cannot but honour Him who is unrivalled. A beautiful image! Thanks! Creation is magnificent. We just need to pause sometimes and take it in. Yes, His works are awesome. Bless you! Amen. May God bless you too, Osita! Nature is beautiful. Most times, we realize that no matter how well we make a painting, it cannot take our eyes off the real thing. God is definitely an artist, He made nature. I totally agree. He is awesome! Bless you! 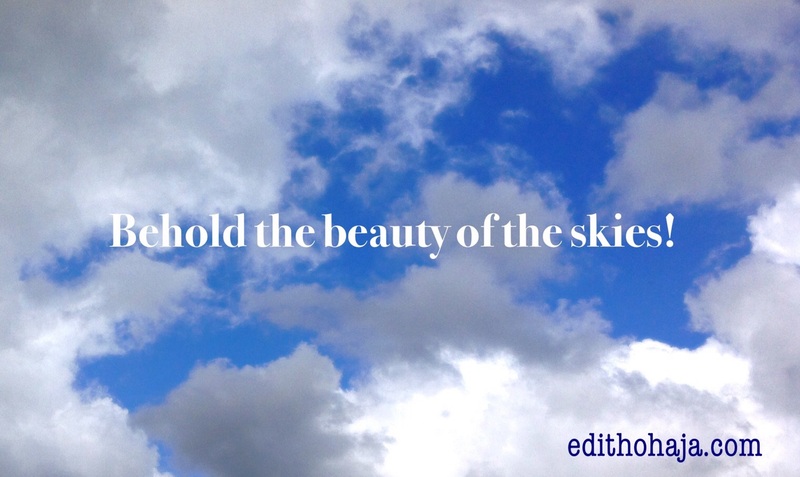 I love your poem, Edith, because I understand the joy of gazing at Jehovah God's beautiful sky! He's a master painter and I marvel at what He does with sunsets, rainbows, and white, puffy clouds! I am in AWE of the beauty of God's sky, and the fact that He alone created it, and His He changed it every day and night; which is truly incredible! How can one not believe in God after seeing The Lord's masterpiece? I am crazy in love with the sky, and I write about it and photograph it all the time. My daughter and I love the sky so much! We always tell each other that come look at God's beautiful sky! Here is one of my most favorite times we experienced an unbelievably beautiful sky together. I hope you enjoy our story! https://angelaslittleattic.com/2015/11/25/the-greatest-artistgod-knows-yougod-loves-you/ Also, I'm sharing your lovely poem on The Silver Lining tomorrow, which is now today! ? Love and blessings to you and yours, in Jesus' name! All things bright and wonderful, all creatures great and small. All things good and beautiful, the lord God made them all! We should learn to appreciate nature, the creation of God.God is perfect in all his dealings even in creation of man for we are perfectly an image of him on earth..
GOD is the greatest artist whose creation is magnificent. Nature is beautiful and looking at it gives me great joy, I'm grateful for God's creation. NEW DAWN GREETINGS MA There is really a beauty in the sky because God is a God of creative that means everything that was created by God was made beautiful the sky is blue in color and blue signifies loyalty .